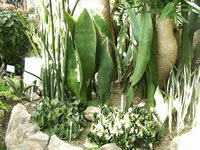 The Mother in Law's Tongue is also commonly called a Snake plant. Sanseveria plants are only hardy in USDA zones 10-12. They are considered a sub-succulent and should always be watered sparingly but regularly, especially in the winter when they are more or less dormant. Overwatering can cause tip burn. The variegated forms of the Mother in Law's Tongue prefer full sun but can tolerate some shade. Sansevierias seem to thrive and flower best when they are kept somewhat rootbound. Your Mother in Law's Tongue will appreciate an occasional sponge bath! Sanseverias, like many other types of house plants enjoy spending their summers outdoors, but is very important to acclimatize them gradually. That is, of course, only if they are full sun plants! Be sure to take proper precautions before you bring your house plants back indoors! Snake plants can be propagated by separating offsets from the mother plant or by root division. Leaf cuttings are another fun method of propagating new Sanseveria plants. making sure to keep track of which end of the cutting is the top and which is the bottom. Insert the leaf cutting (TOP END UP) an inch or so into a moist (never soggy) sandy loam or vermiculite rooting medium. Keep the temperature of the rooting medium at around 75° F.
New roots will start forming in about 3 or 4 weeks but it will take 2-3 months before you begin to see the first new leaves. Each cutting will produce several new plantlets.